Both directions of the H-1 freeway from Halawa to Pearl City will be closed from 9:30 p.m. to 4 a.m. on Jan. 17, 18, 19 and 23 for the final stage of a widening project. 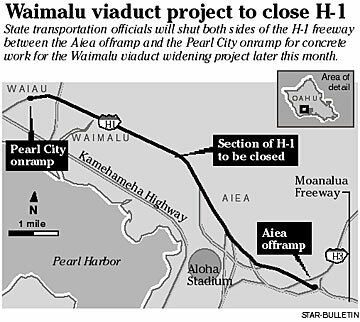 State transportation officials will close the freeway before the Aiea offramp of Moanalua Freeway to the H-1 Pearl City onramp. The closure could last only one night, but officials are giving contractors four nights to complete the job. Motorists traveling Ewa can take the Aiea offramp onto Moanalua Road and Kamehameha Highway before returning to the freeway at the Waiau Interchange. Town-bound motorists can return to the H-1 freeway after Aiea. The freeway is being widened to alleviate the island's worst bottleneck congestion, said Scott Ishikawa, state transportation spokesman. The state is adding a sixth lane to the Ewa-bound lanes to the Pearl City offramp, which is scheduled to open in April. Contractors for the state have to fill a 5-foot-wide, 9-inch-deep gap between the new and old sections of the freeway along 1,245 feet of the Waimalu viaduct. Ishikawa said they have to close the freeway so vibrations from vehicles will not prevent the concrete from setting properly. Pearl City area residents say they have been looking forward to the new lane, especially after 18 months of traffic and noise from the construction. "It's great that it's going to be open," said James Pickard, 65, who lives in Pacific Palisades and is a member of the neighborhood board. "It's going to bring some relief, but I don't believe it will solve the problem." But some residents are already wondering if the extra lane will be enough. They are more concerned about the new Wal-Mart going up by Sam's Club, expected to open later this month or in early February, and the additional traffic it will generate. "It's going to be such a terrific facility where everyone will want to go," said Albert Fukushima, chairman of the Pearl City Neighborhood Board, "but it's going to be a nightmare for traffic."